Today, we’re really happy to let you know that you can now watch our film subtitled in Portuguese. AGAIN, this is thanks to the generosity of time and energy from our amazing audience… people like YOU who have come forward to help us out with raising the world’s awareness about diet and health. This time around we have Hilton, from Paleodiario.com, a blog dedicated to the lifestyle that has seen a ton of people take control of their health and turn things around! We’re forever grateful to these guys! Whenever we add subtitles for yet a new foreign language we are become beyond hopeful that some day soon, people around the globe will know about paleo… because whilst it’s now mainstream in North America, this is NOT the case in some other parts of the world. People still wonder what it is, confuse the dietary aspects of it with vegetarianism (or worse veganism). So we know we still have much work to do in the way of exposing people to a way of life that goes against conventional health wisdom, a way that does not involve manmade foods. Help us help more people: if you or someone you know wants to translate the film on a voluntary basis, by all means, please contact us here. Updates on We Love Paleo and WLP2! It’s been a while… Time for an update on our two films, my friends! Every week I get yet another email from someone wondering if we’re working on subtitling the film in their language. Most of the time their enquiry stems from a growing concern for people in their community who are ”riddled” with lifestyle diseases and who direly need to become aware of ancestral health. So I am pleased to let yo know that we are working on subtitling We Love Paleo in two additional languages thanks to passionate volunteers who want to give back to their fellow human beings. If you are (or know) someone who would like to help subtitle the documentary in your native language or any language other than French, German, Spanish and Czech, simply use our contact form to get in touch! We’ve decided to push back our crowdfunding campaign on Indiegogo. (Photo shown above.) That’s right: our new campaign launch date has yet to be determined.–We’re hoping sooner rather than later, though. Whilst making an indie film is down right rewarding, it can also at times be a real b!tch; our team has decided to develop our core concepts a tad more before we go out and ask for our fans’ support. Make no mistake, however: just like our first film, this documentary sequel is definitely getting made and it will be a darn good one too! Stay tuned regarding our campaign launch date: we will be needing our loyalest supporters to renew their faith in us by backing the second film. http://welovepaleo.flywheelsites.com/wp-content/uploads/wlp-logo-300x137-300x137.png 0 0 welovepaleo http://welovepaleo.flywheelsites.com/wp-content/uploads/wlp-logo-300x137-300x137.png welovepaleo2017-10-25 21:36:062017-10-25 21:38:19Updates on We Love Paleo and WLP2! 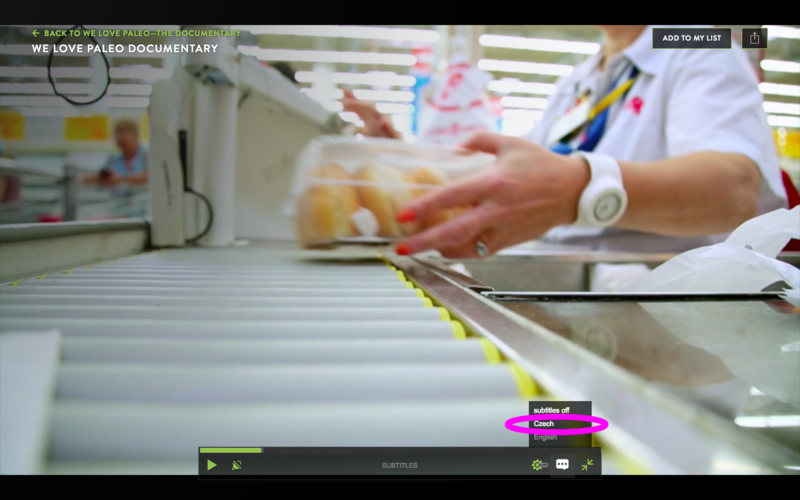 Our indie documentary now available subtitled in… Czech! Watch the film now with Czech subtitles. | Podívejte se na film s českými titulky teď. We’re very happy to announce that you can now watch our film on VHX in Czech language. That’s right… Czech! Perhaps it’s your native language or you know someone who speaks Czech and could benefit from watching We Love Paleo in their native tongue. Oh and before we go, we would like to publicly thank Alena Suchá, our devoted volunteer who worked tirelessly for months on end to translate a film she felt very passionate about! Watch the film now. | Podívejte se na film s českými titulky teď. http://welovepaleo.flywheelsites.com/wp-content/uploads/wlp-logo-300x137-300x137.png 0 0 welovepaleo http://welovepaleo.flywheelsites.com/wp-content/uploads/wlp-logo-300x137-300x137.png welovepaleo2016-12-14 02:04:082017-02-08 05:26:42Our indie documentary now available subtitled in... Czech! Today marks an important milestone in any film’s development process.—It’s the day we share We Love Paleo’s trailer with the rest of the world! Our goal with We Love Paleo is to reach a larger, more mainstream group of people who might otherwise never come across the paleo principles and ultimately inspire them to try it out for themselves. All this whilst entertaining them with a good story. There’s something in it for paleo enthusiasts too, who will probably enjoy the fact that there’s (finally) a film touching on obvious topics such as nutrition, but also, fasting, sprinting, movement, chronic cardio, sleep and lots more. Enjoy and thanks in advance for sharing our trailer with anyone and everyone you think WLP might benefit once it comes out! NOTE: To view all our pre order packages, go here. 1- Is it finished? Nope. But we’re almost there! We’re still working on animations that pack a punch. Bootstrapping the whole post-production (as you probably already know from earlier posts) and completing motion graphics ourselves to the highest possible standard along with chasing up external media clearances (which often takes a long time) has proven to take way longer than expected… Thanks for having faith in us. 2- Why did you create a trailer before finishing the film? We felt like you can only stop sharing material with your audience for so long before people start thinking the film will never come out or (worse) forget about it altogether. It was therefore imperative that we have something to show for all our hard work even if some of our better animations didn’t make it into the trailer. Thus although WLP will be showcasing plenty more animations, great clips and archival footage… there’s only so much you can show within a 3-minute clip. 3- When are you releasing it? There’s a lot of chasing around for formal permission when you’re using other people’s material (such as photos, video, etc. ).—This is where I secretly wish I was Sofia Coppola and could readily use my “filmmaker’s magic wand” (i.e. the phone) to get everything sorted almost instantly. This said, we really don’t see ourselves releasing the film beyond summer 2015. 4- Is this the only trailer for the film? Yes, unless a third party (aka a film distributor) wanted to cut a new version. We’re now focussing on getting WLP passed the finish line within the next couple of months. 5- Will you be submitting the film to festivals? Yes, we do have some in mind. Our approach is to submit the film to festivals that don’t require us to premiere at their event since we don’t want our audience to wait any longer to enjoy our debut feature documentary. We’ll surely keep you posted on those developments as well.